The B1 domain of protein G has been a classic model system of folding for decades, the subject of numerous experimental and computational studies. 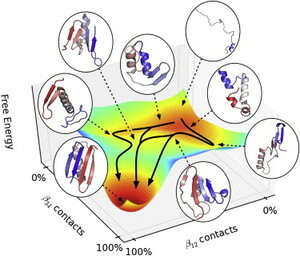 Most of the experimental work has focused on whether the protein folds via an intermediate, but the evidence is mostly limited to relatively slow kinetic observations with a few structural probes. In this work we observe folding on the submillisecond timescale with microfluidic mixers using a variety of probes including tryptophan fluorescence, circular dichroism and photochemical oxidation. We find that each probe yields different kinetics and compare these observations with a Markov State Model constructed from large-scale molecular dynamics simulations and find a complex network of states that yield different kinetics for different observables. We conclude that there are many folding pathways before the final folding step and that these paths do not have large free energy barriers.